Last night I slept in a tree house. It was a sumptuous sleep on a bed of soft clouds at the base of a magical mountain. Lest you assume it was “spirits” that somehow spawned my dreams, let me explain that the tree house was actually a spectacular cedar lodge called the Tree House in the town of Mt. Shasta. Much has been written about the spiritual power of Mt. 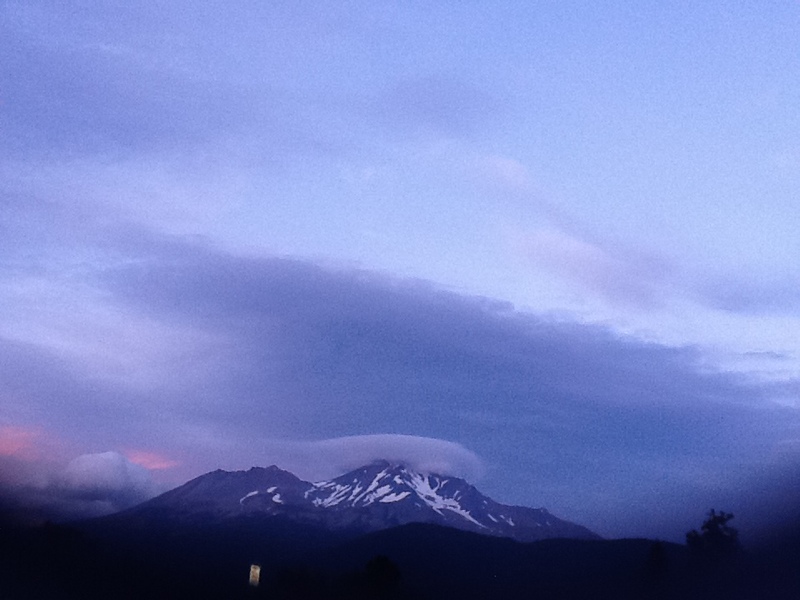 Shasta, which rises above the Cascade Range like a mythical god that can be seen for 100 miles. At the base of the second largest volcano in the continental U.S. is the postcard-like town of Mt. Shasta. It’s a town where crystal shops and healers can be found side-by-side with sporting goods outlets. The Native Americans believe Mt. Shasta has healing properties and people come here to worship at its feet. I came here, too, last month, to be one with the mountain — and I couldn’t have picked a better weekend. Rain was in the forecast and a gray-purple haze was amassing over the snow-covered crown. It was the poet Joaquin Miller who said Mt. Shasta was “lonely as God and white as a winter moon.” To me, it looked more like a chocolate sundae with marshmallow cream. But as I sat on my deck at the Tree House, I watched the sun set and the mountain morph into a heavenly icon. An aura was forming over its peak, and it looked like a halo of wispy white clouds or a spaceship hovering above. “They’re called lenticular clouds,” said the girl at the front desk when Imentioned the phenomenon later. A lot of people think they look like UFOs.” It was like seeing the Northern Lights, and I was reminded of a trip I once took to a volcanic range in Iceland, where Jules Verne wrote “Journey to the Center of the Earth.” While there, a spiritual healer told me about a hidden stretch of beach covered with black lava rocks. “Find a male (oblong) and a female (round) shaped rock and you’ll have a powerful magnetic force,” she advised. I did as she said and brought home a pair of shiny black stones. It occurred to me as I walked the streets of Mt. Shasta that volcanoes might indeed have powers beyond what we know to be true. One thing I do know is this — if you’re lucky enough to see a lenticular cloud, it’s something you’ll never forget.